At the beginning of high school, Joel Mwale, currently 20-year-old, caught dysentery from drinking contaminated water provided by his municipal council during Kenya’s annual dry season. As he was slowly recovering from the illness, he started worrying that this disease would “keep on happening, year in, year out, what if next year the same problem happens.” He decided that he should do something and started actively thinking about possible solutions to this problem. As soon as he came out of the hospital, he invested all his savings, totalling around $95, to build a borehole in his village. Helped by local volunteers, he began digging the borehole and eventually found water. He subsequently installed all the technical requirements that would allow him to enable the water’s extraction. The well currently provides clean water to over 500 local households. “It works in such a way that somebody has just got to turn a wheel then a lot of water comes out on the other end,” he says. Encouraged by his project’s success, the young Kenyan started dreaming about greater, more ambitious projects. Unfortunately, after his grandfather’s death, who was paying for his high-school fees, he had to drop out of Friends School Kamusinga at Form Three. While other people would have been discouraged by this turn of events, this was not the case for Joel, who decided he wanted to create a business that could pay his fees and help him support his family. After convincing the owner of the place to lease him the location, Joel had to purchase a purifying machine to process the rain water, but soon discovered that this piece of equipment was quite expensive. While, during the subsequent three months, he searched constantly for lenders to provide the funding needed for his business to take off, no one seemed interested in believing that the 16 year-old’s idea was viable. Much to his mother’s disapproval, Joel decided to lease his father’s 20 acre land and used the money obtained to buy a water purification machine and pay off his operating costs for his business. Soon afterwards, SkyDrop Enterprises, a rainwater purification and bottling company producing low-cost drinking water, was opened. During the wet season, the company would focus on collecting rain water, while during the dry season, it would sell the purified drinking water. In its initial stages, SkyDrop Enterprises was only able to sell only 10 bottles of water a day, as a result of significant competition from already established drinking water bottlers. Nevertheless, in time, it managed to secure some market space in Trans Nzoia and his business records a turnover of Sh2.5 million annually. In 2012 alone, the company sold over 33,000 bottles. 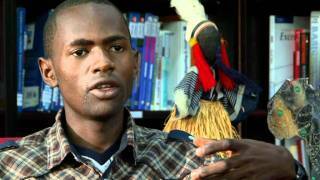 In 2011, Joel won the Anzisha Prize for youth leadership, recognizing innovative solutions to solve problems facing their communities. In winning the prize, which provided him with $30,000 to develop his business and a two-year scholarship to attend the Africa Leadership Academy (ALA), he beat out 186 applicants from 22 countries. The Anzisha award has helped the young Kenyan support his business, so that he currently employs 20 workers, including his mother. He has also registered SkyDrop as a limited company. In 2012, he also received $2.5 million from the MasterCard Foundation to support his project. The young Kenyan entrepreneur is currently focused on expanding his business, by drilling a new borehole into a newly purchased piece of land, which will allow him to produce 6,000 liters per hour, as opposed to 5,000 liters his current plant provides. This is not the only charitable work conducted by Joel, who has already funded the construction of four boreholes for communities in need and intends to continue doing so.